Author’s note: In Star Trek, IDIC—"Infinite Diversity in Infinite Combinations"—is the foundation of Vulcan philosophy. Embracing it as part of our company culture means encouraging, celebrating, and leveraging a team whose perspectives are informed by a wide range of backgrounds, experiences, and identities. We believe our success and growth as a company is underpinned by a diverse set of people coming together to tackle hard problems. This is the first of a series of posts about Veo's culture where we will discuss how we actively work toward this. When Patrick, Scott, and I founded Veo, it was important to us to create an environment where people from a wide variety of backgrounds could feel respected and welcome, and could participate fully in building an amazing company and groundbreaking products. I know from experience how tough it is to be the only [fill in the blank] in the room. It’s hard to feel like you belong when lunch-time conversations take for granted things that don’t represent your life. It’s hard to project authority when people assume you’re attending an event as support staff or a spouse. It’s hard to be confident when you feel like an anomaly. Sometimes, it’s just plain lonely. To a young engineer, or a kid who’s interested in tech, representation really matters. I’ve seen first hand how just a glimpse of someone who looks like you doing an important technical job can send you down a career trajectory that you wouldn’t otherwise have considered. Building a company that prioritizes equal representation is important—but it’s not easy. We’ve made progress: our management team is about 50% women and most of our meetings pass the Bechdel test, which has made a real difference for many of the women who work here. But we have a long way to go: for example, only a few of our individual contributor engineers are women. And while our numbers on the “women” axis look relatively good compared to many other tech startups, there are a lot of other axes we can do better on. 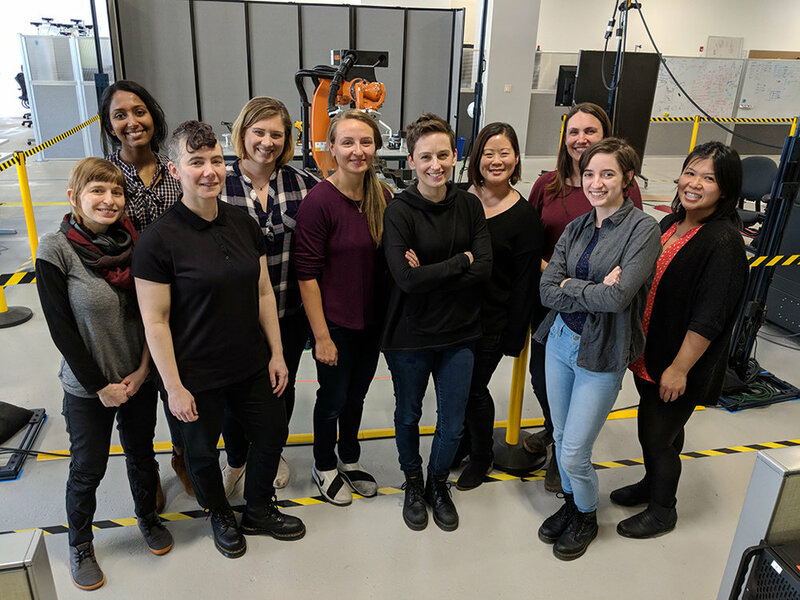 In honor of Women’s History Month, we’re taking this opportunity to highlight some of the amazing women on the Veo team, give a little behind-the-scenes view into the work they do at Veo, and share some of their experiences as women in tech. Meena Vembusubramanian is Veo’s Director of Product Management. She is responsible for understanding both the challenges our customers face and what is technically feasible for our team to accomplish—and then merging the two into a product that does not break time, physics, or the bank. As VP of Sales and Business Development, Molly McCarthy has spent the last year and a half building relationships with customers and designing a strategy for getting Veo’s technology into the market. She uses her experience in the semiconductor industry to identify technical experts and decision makers at different levels in manufacturing companies, and communicate the value Veo can bring to their production lines. As Veo’s first product release approaches, Molly is spending more of her time visiting customers and working directly with early adopters to find good fits for Veo and close our first sales. While our experiences as women in tech are vastly different—some of us are new to the workforce, some of us are new to robotics, and some of us have worked in this field for decades—they also overlap in many ways. Clara: “I’ve been an engineer for over 20 years now. Early in my career, I barely noticed the lack of other women—I was pretty used to it from my high school and college math and physics classes. But as I’ve grown older, I’ve come to realize how much working with other women means to me. When we founded Veo, we had the opportunity to bake in some company policies and norms that would help make Veo a place where women wanted to work. One way we’ve done that is by recognizing “women’s issues” as human issues. It sends a big signal when your male boss says he’s leaving early to pick up his daughter from ballet class, or when a man on your team takes twelve weeks of paid parental leave. These things create a culture that is more welcoming to women and other underrepresented groups—but also a culture that is more supportive and more effective for everyone. For Halloween 2018, some of us dressed as Robotics Engineer Barbie—a new product released that year. We were delighted to see representation of women like us in pop culture. What advice do you have for people thinking about working in engineering, industrial automation, or just tech in general? Clara: “At the beginning of your career, stay in technical, individual contributor roles. In my experience, female engineers on average tend to have better social skills. Who knows why—I think it’s because our society tolerates a level of social cluelessness in young boys that we do not tolerate in young girls. Which means that girls are often forced to become better at social interaction even if they’re girls like me for whom this does not come naturally. It’s all too common for employers to steer young engineers with better-than-average social skills into project management, customer-facing, or support roles. These are critical roles and it’s wonderful to have brilliant women doing them, but making the switch early on can deprive young women of the time they need to mature as engineers—to build the strong fundamentals and deep technical expertise that are required for senior technical and engineering leadership roles. My job today doesn’t involve a lot of direct technical contribution, but I could not do what I do without years of experience writing code, shipping features, and building products. We’re doing our best to make Veo a great place to work for everyone who has the skills, drive, and desire to contribute to what we’re building. In future blog posts, we’ll share more about the specific ways we go about building and maintaining a rigorous, respectful, and welcoming work culture.